I’ve had my Thanksgiving dessert plotted out for weeks now (predictably, it will be a pumpkin pie), but if I didn’t, I think that this Pear-Cranberry Roll-Up Tart would be making another appearance on Thursday. Yes, a “roll-up tart”…intriguing, right? I’ve never made a roll-up tart before. I imagined forming it would be like making a strudel with pie dough, but actually it was more like rolling up a burrito. 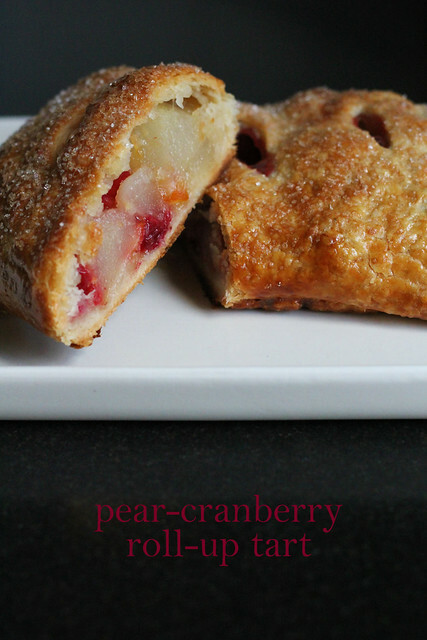 The filling here is made from seasonally appropriate pears– I used Bosc– and cranberries. I think baked pear desserts are pretty awesome, and the orange and ginger flavorings in this filling really compliment the pears (and the cranberries, too). The fruit is rolled inside the very same galette dough we used for our Apple Pielettes last month. I’m big on this dough. It couldn’t be easier to handle and it bakes up really flaky (the sanding sugar on top here is a nice sparkly, crispy touch). Also, it slices cleanly, so you get a good presentation instead of a crumbly mess. I’ll certainly be trying it out on a regular pie at some point. For the recipe, see Baking Chez Moi by Dorie Greenspan. Don’t forget to check out the rest of the TWD Blogroll. Happy Thanksgiving! A pie made with this dough sounds like a great idea, especially with this phenomenal cranberry-pear-ginger filling. I’m glad I wasn’t the only one who felt like they were making a burrito! Amazing photos! The evenly browned and sparkly exterior of your tart is very appealing. Enjoy your Thanksgiving tart! Your tart is seriously picture perfect! Great job! For some reason I had some issues with rolling mine up…cracks everywhere. Everyone loved it though. We loved this one too. 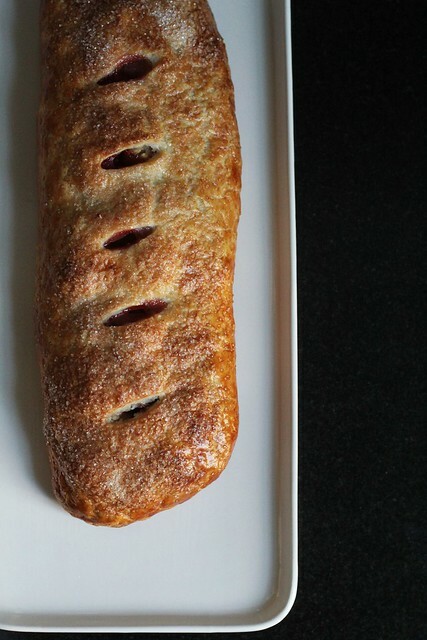 Some other bakers have mentioned strudel and a few made the apple and raisin version. Another great dessert. This was delicious, wasn’t it. Your tart looks superb.